Few people speak as well as Leonard Bernstein; he is eloquent, calm, and effective. When he speaks, he creates an inspiration to learn. He influenced a generation by creating the Young People’s Concerts; through those concerts, his Harvard lectures, and his numerous interviews, his educational legacy is seldom matched. Yo-Yo Ma though, has established himself as having many of the same interests, as well as the same speaking gift. In Ma’s Nancy Hanks Lecture on Arts and Public Policy, he posits that we all need to push toward the “Edge Effect” in order to create “Art for Life’s Sake.” This lecture, although an hour long, is well worth the time. Simply put (and without exaggerating), the talk is life-changing. 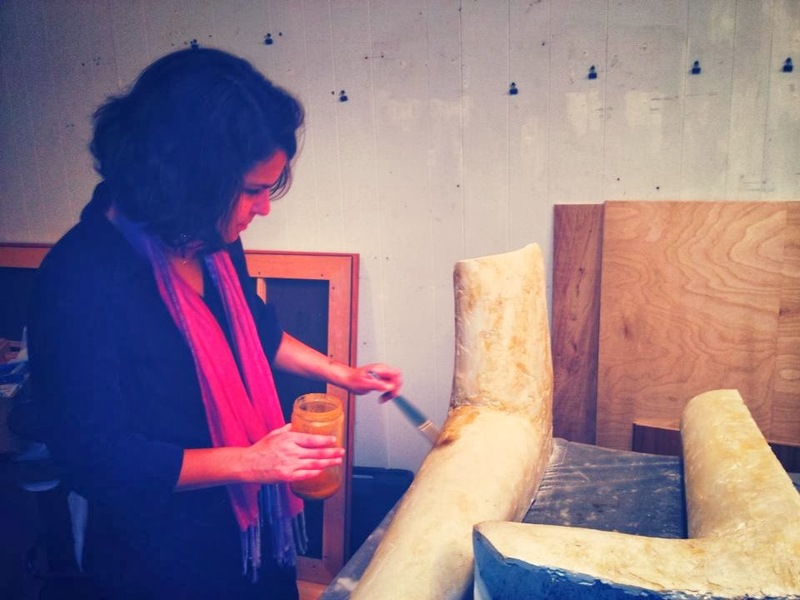 Susanna Loewy painting "sets" for collaborative performance. The thesis: In ecology, the place where two ecosystems merge is where there is the most diversity in species, and where the most growth occurs. The two habitats influence each other and the biological density flourishes. This phenomenon is called the “edge effect.” Yo-Yo applies the concept to the arts, saying that in order to continue to create new, interesting, and sustaining art, we have to push toward our own edges. We need to meet the other art forms and allow ourselves to influence (and be influenced by) our surroundings. And actually, he doesn’t just appeal to the arts… he says that we have to address the three engines of our society -- the political, economic, and cultural engines -- and overlap wherever we can. If we can create the venn diagram overlap between the three, that intersection is where we have the most potential. Yo-Yo speaks beautifully, and interchanges performance examples with fact, creating a woven lecture concert that every artist and educator should experience. It’s easy to rely on what we know. As musicians, we know orchestras and the standard type of concert hall performance. Visual artists know gallery openings. There is a resistance toward trying something new, because new things can fail. If we combine the arts, if we’re outside the concert hall, are we still valid musicians? Moreover, is the end result ridiculous? That’s certainly a possibility… but within that sometimes scary liminal space, there is also the alternative of creating something meaningful. An example: Cheryl Hochberg, the visual arts department head at Kutztown University (where I am the flute professor), has an art opening at Montgomery College in Maryland next week. After viewing the Ballet Russe exhibit at the National Gallery of Art last spring (and attending an accompanying concert), she had the idea that, in a ballet, the costumes are what bridge visual aspects of the art (set design and dance) to music. She contacted me about collaborating to create a costumed musical experience at her art opening. At first, I was skeptical. Costumes, really?? But then, I got inspired. What music would relate to her work? My answer: Cheryl’s work is slightly surrealist -- nature scenes that are, in some almost unidentifiable way, tweaked. So, I thought music within the neoclassical vein would be effective; the standard framework of the classical time period influenced with sarcasm and understated pain seemed to appropriately match Cheryl’s art. Next, how could the costumes work? Musicians generally aren’t all that gung-ho to wear capes, masks, and tights. I was a bit nervous about the whole venture, and the feasibility of selling it to the musicians involved. But, I had the opportunity to talk with Andy Brehm, the costume designer, and together we (Cheryl, Andy, and I) came up with a concept that works. Andy and his students (with Cheryl’s help) are creating stationary boots made of plaster that are modeled to represent the lower portion of an animal. Next, the music stands are being rebuilt to act as the animal torsos. So, the musicians (dressed in black pants and matching colored turtlenecks) step into a ‘set’ of sorts and perform as characters inspired by Cheryl’s work. It might not work. Even with the absence of capes and the like, the whole scenario might wind up feeling insane, or silly… but I really don’t think that’s going to be the case. I think it’s going to be incredible. I’m excited about the performance next Thursday; I think it has real possibility of uniquely influencing audience members. If nothing else, that audience we’re creating is something new and different. Some people will be there to hear the Inscape musicians. Some people will be there to see Cheryl’s work, and some for Andy’s. With any luck, all three branches will overlap and be changed. They’ll be more aware of the other art forms around them; perhaps the art enthusiasts will keep going to Inscape concerts, and maybe the music aficionados will become more aware of art openings. And that effect of creating new interest is what we, as musicians today, need to grasp. We can’t isolate ourselves and stubbornly insist that the model we’re used to is the only relevant model. Of course, the seemingly silly and insane projects also don’t have to be the only things we’re doing, but eclecticism certainly needs to be embraced with as much enthusiasm and vigor as projects more standard. And here’s something else: Last Thursday, I had a day that seemed like it would never end. It was 9pm and I had been going since 5am that morning. As I was getting ready to leave Kutztown, I stopped by Cheryl’s house; I knew she, Andy, and the students were working on the boots, and I wanted to see how it was going. I walked into the house and sat down on the spinning chair just outside the studio doorway. Cheryl glanced up and told me to come to look at what they were doing. I walked over and as I was standing there looking over their plaster creations, she handed me a paintbrush. I play the flute; I don’t paint. My reaction was to look at it skeptically and grimace. I’m a little scared of visual art. Cheryl rolled her eyes and handed me the yellow paint. 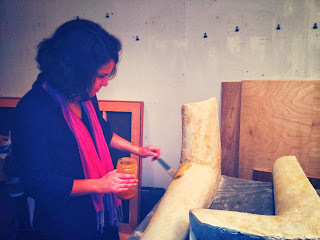 I reluctantly started covering the boot with paint, and before I knew it, I had my hands in yellow wax and my dress and shoes were covered in dusty plaster. More importantly, I felt both calm and invigorated in a way that I have seldom experienced. The art -- it was so different than practicing, than anything to do with music. After a long day of teaching, organizing and performing, it was exactly what I needed. Spotify was playing, and while I’m not normally a fan of background music, in this case it just melted into the artwork and the atmosphere. I had physically stepped from the doorway into the studio, and was then merged into a different world. I no longer felt alone or isolated; I was part of group of artists… and the fact that I’m actually going to perform in these boots makes it all the more meaningful. I was involved in the creation process, and the performance will mean that much more. Art: for life’s sake. I feel lucky to be part of this project, and I’m inspired to create more. It won’t necessarily be the same model (nor should it be), but I’m excited about pushing myself and others to a different plane. I’m obviously not Yo-Yo Ma, but I think that I have figured out an example of an edge effect, and it feels amazing. We can’t all be world famous educators or musicians, but we can all influence our own realms; we just have to figure out how we’re most effective. Simply put, I think this “edge effect” and creation of “art for life’s sake” are worth examining thoroughly. The interpretation will always be different, and that’s how it should be.